Today I’m answering the questions that I got on my post last week. The number was pretty manageable so I’m just going to break it up into two posts. 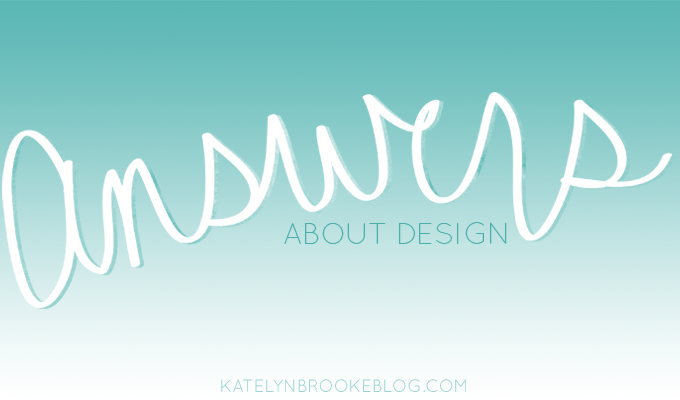 Today’s post is about design and my work, and tomorrow’s will be more about personal stuff. As someone who is learning design in my spare time on my own, how did you get started? I really think that design is all about honing your skills and training your eye to create a style that is yours- it takes a lot of practice, and it’s something that all designers are constantly working on as they evolve! As far as web design goes, I’ve heard great things about Nicole’s Classes and Lynda.com for learning Photoshop- I was lucky in that I came out of college with a design background and knowing my way around Adobe Creative Suite, so I haven’t used either of them personally. I got started with blog design by taking a class with April of The Blog Designer Network. Do you have any suggestions on where to start learning about how to write the code to turn a design into a working site? There are tons of great resources out there! Zoe Rooney recently compiled a bunch of great resources for learning web development. The class that I took through the BDN was a great foundation for learning code, but I’ve also been a member of Treehouse in the past and that is a great place to start as well! There are really so many learning opportunities out there. If you’re starting from scratch I would just look around and find something that feels right for you, trust me- it’s out there! What are some tips for someone just starting out, and do you have any resources for someone who wants to succeed in this field? I think the hardest thing about working for yourself in a very subjective field is just trying to stay positive when things don’t turn out exactly as you want them to. Always learn from your mistakes and if it’s something that you know you’re meant to do, stick with it! How’d you start your design business? How did you get clients, get your name out there, etc.? Truthfully, it was kinda slow going at first. I put up my website in November of 2011 and my portfolio consisted of my website, 2 of my own blogs, and a blog that I designed for a friend. I think my first clients found me through The Blog Designer Network, and then as I launched a few blogs and my own blog grew, things really started to pick up around February. It was really a combination of things- my clients came from a bunch of places, including Twitter, Pinterest, and finding me through my blog. Just remember that it doesn’t happen over night and try not to compare yourself to other designers- you have no idea what’s going on behind the scenes. And keep in mind the best advertising you can get as a web designer is for others to admire your work on another site. What do you think are the most important things to include in your blog’s sidebar? I think the most important thing is to have your social icons apparent so that people can get in touch with you if they want- that can be in the sidebar or somewhere in the header. I also think it’s important to have your face be one of the the first things that people see in your sidebar, especially if you’re like me and you don’t always have pictures of yourself in the posts themselves. After that, the only thing that I think is necessary that everyone have is a search bar. I get annoyed when I can’t find what I’m looking for in the archives and it’s not there! You studied architecture in college- what were your original plans for that degree? And what does one actually do with a degree in architecture? I wanted to be an architect! When I was a kid my mom and I used to look at model homes every other weekend for fun (and we still do it when we get the chance, just not as often.) I wanted to be the one who designed those houses. But when I got to college, it became clear that what I thought being an architect was like was not what it was in reality (or at least what my professors portrayed it to be like.) In the end I wound up going with my gut, knowing that it wasn’t what I wanted to do, and kind of took a leap after graduation and didn’t pursue getting a job at an architecture firm. But it was during that period of time that I discovered web design, so in retrospect I think everything happened the way it was supposed to. Is design is your forever thing (or at least as far as you can think of) or is it’s a ‘for now’ job while you figure out/pursue what else you want to do? It’s hard to say because the internet is always changing. I know that I really love what I do right now, but I could definitely see it evolving into something else over time- I’m just not sure what that is yet. As weird as it is for me to say this being the introvert that I am, I see myself finding a way to interact with others on a more daily basis in the future. As much as I love working from home and not having to put on makeup everyday, the reality is that there’s something to be said for interacting with others face to face. Maybe that is something I do through my job, but maybe not- it’s hard to say! What a normal work day look like for you? Thanks to Aggie, Allyssa, Chloe, Diana, Eliza, and Jenn for contributing questions! Thanks for mentioning my post! Totally agree with what you’re saying about building a client base. My clients mostly come through word of mouth and through people seeing my work out there. Nothing beats time + hard work! Isn’t it funny how time seems to go even faster on the internet? Craziness! This is great! Thanks for sharing so many great resources! No problem- I hope they’re helpful! Do ittttt! You’re so talented and have such a unique aesthetic- you just gotta keep putting yourself out there! I know what you mean though- I definitely feel that way sometimes too! So many great questions! I’ll have to check out all the resources you listed. I liked reading this! I totally agree with everything you are saying… Makes me want to go back to designing & get better at it! Hi. Stupid question–When you say you design websites, does that mean you use a template or do you start from the ground up? How does it work? If it means working with a template that someone else has made…I think I could learn that! But if it means designing one’s own template….that sounds fun, but really….hard? !